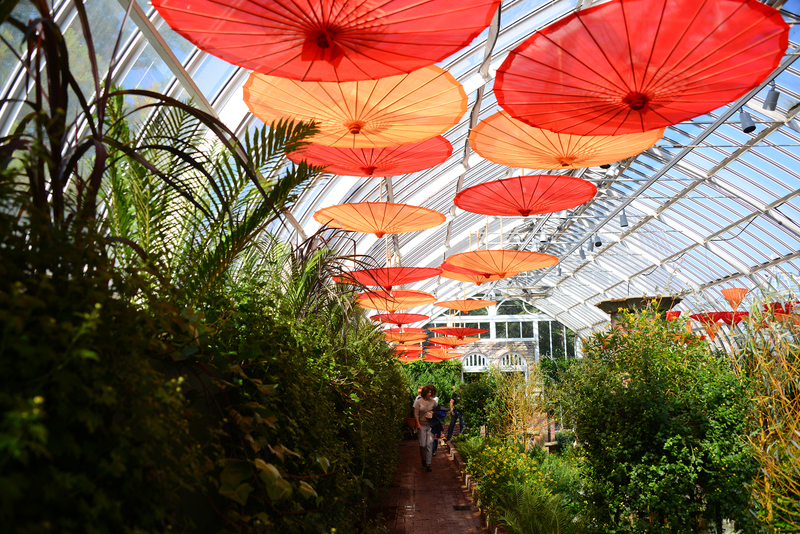 Umbrellas are in display in the Sunken Garden at Phipps Conservatory and Botanical Gardens in Oakland. Planning a special event or party, or planning to go to one? Here are five venues where I love to go to events for the Post-Gazette’s Seen section. This is not your mother’s hotel. A truly visual feast, this new Downtown hotel is a chic, fabulous place to hold your next event. Just walking in feels like a special occasion with all of the dazzling colors, patterns and textures. The ballrooms are more intimate than in other venues around town, and feel fresh and modern with the unexpected touches such as the graphic black-and-white carpet. This is the place that has people talking long after they’ve left. Want a tropical escape in the middle of January? To venture to a far-off land without ever leaving the city? Phipps in Oakland is the place for dreamers, which is why it makes such a beautiful backdrop for parties, big and small. Take a tour around the world while your guests mix and mingle in the butterfly room, the tropical forest or toast with Champagne in Africa. And no floral budget needed! This hidden gem on the South Side is known to attract a quirky, artsy crowd, most likely because the space is set up for surprises around every corner. It lends itself to creating a story as partygoers wind around from one area to the next. Many events — such as the Pittsburgh Film Office’s Lights, Glamour, Action! patrons’ party — use this fact to their advantage, offering exciting things to do, taste and see around each bend. One of my favorite event spaces because of its versatility. Its modern, clean lines, and floor-to-ceiling windows make the city itself feel like part of the party. The space can transform from a dark circus, as for the Cultural Trust’s Cosmopolitan Pittsburgh, to a smart networking event, such as Hot For Your Health. Once a school, now a warehouse space full of possibilities, this Uptown space has given new life to the area by hosting artists, international tech talks and Quantum Theatre’s Q-Ball to name a few. It’s hard to decide what is more breathtaking: The expansive views of the city or the vastness of the space that can literally transform into any dream your heart desires. The free parking lot is a major bonus.